Central forced air heating (furnace) and air conditioning systems operate by pushing conditioned air to each room in a house. To return the “stale” house air back to the furnace return registers have to be installed throughout the house, pressure balancing each room. In a typical house these return registers exist only in common areas (1 or 2 per level) and not in individual bedrooms. To help the stale air get back to these central returns, builders will often undercut doors. These undercuts can be inadequate for providing enough air flow, especially when plush carpet and under-padding are installed or for large bedrooms with multiple supply grilles. Inadequate return air pathways can result in pressure imbalances, which can cause drafts and temperature differences between rooms or floors, leading to comfort complaints. The typical recommendation is to provide 1 square inch of free area opening per 1 CFM of conditioned air being pushed into the room. 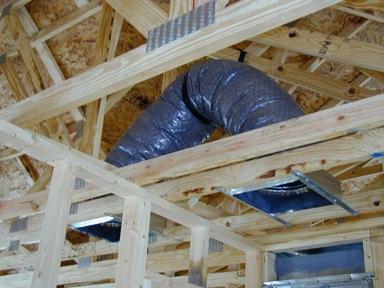 If building return air ducts into each room is not possible, one common option is installing jump ducts or transfer grilles in the rooms that are often closed. 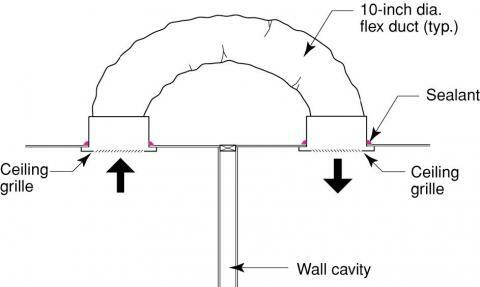 A jumper duct is a short piece of insulated flex duct installed in the attic and attached to ceiling grilles in the closed room and a common space. This provides a return air pathway between the two areas. Typical jump duct. Note the sealant around the grilles. Jump duct installed in new construction. Images courtesy of DOE’s Office of Energy Efficiency and Renewable Energy.